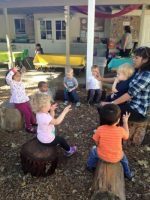 The Roots & Wings Preschool Outdoor Classroom is a lovely setting to play and grow. We believe a lot of learning can take place outside. Our site is unique in that carefully designed outdoor centers replicate each part of our indoor curriculum. Upon entering our site, children can cross our natural wooden bridge or stop to check out what’s happening at the school garden. Storytime might be happening in our outdoor gathering area where tree stumps of different species are scattered around a mature tree. 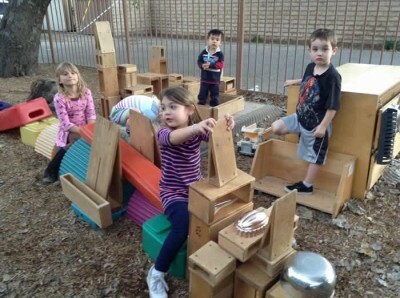 Our raised building platform helps define the space where children are building large creations with our outdoor wooden hollow blocks while other children are collaborating on a tune at our sound wall in the music and sound area. A teacher is interacting with a group of students at our loose parts area, which holds carefully curated collections of recycled and natural objects. Here you find baskets of pinecones, twigs, pretty stones, wood shapes and cardboard tubes, to name a few. 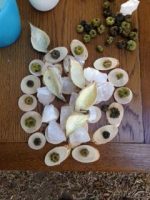 They might be using them to support their imaginative play or quietly arranging them on a wood table designated for such parts. Our large easel in the art area is home to children painting outdoors. Parents and families play a large part in the Outdoor Classroom. They volunteer weekly to help in the garden. Our eco-art cabinet is filled with lots of recycled materials to have at-the-ready, and parents help both stock and sort this frequently. 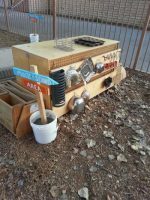 It’s easy to access and add new items to our loose parts area, which we do monthly. Lastly, parents meet monthly at local parks for a nature-themed playtime. In the future, Roots & Wings plans to renovate the front exterior landscaping; removing water-thirsty turf and replacing with drought-tolerate plants both appropriate for the arid Southern California weather. Since the indoor classrooms look out onto this space, we hope to choose native plants that attract birds, bees, and butterflies. A birdbath is also planned so a child can watch birds closely from inside the classroom. Finally, we would like to purchase rainwater barrels to collect the rain from the roof, add a solar-powered drip irrigation system to our school garden and create a mud-play area in the outdoor classroom. Having recycled water for these areas also lessens the overall water consumption at the school. A huge, mature oak tree gracefully shades much of the yard and provides us with a constant reminder of the power of nature! The Outdoor Classroom is a special place.